QE is partly to blame for record share buybacks and meager capital spending. 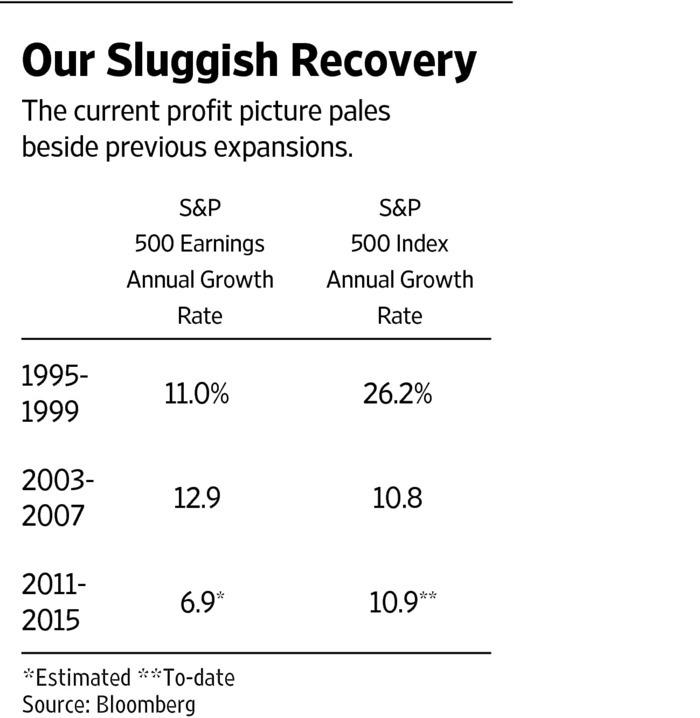 During the past five years earnings of the S&P 500 have grown about 6.9% annually. As the table nearby shows the current profit picture pales in comparison to prior economic expansions, in which earnings grew significantly faster. Moreover, only about half of the profit improvement in the current period is from business operations; the balance of earnings-per-share gains arose from record levels of share buybacks. So the quality of earnings is as deficient as its quantity. The current economic expansion is also unusual because the stock market and other financial assets have boomed in spite of relatively muted profit gains. Extremely accommodative monetary policy, including the purchase of about $3 trillion in Treasurys and mortgage-backed securities during three rounds of “quantitative easing” (QE), pushed down long-term yields and boosted the value of risk-assets. Higher stock prices were supposed to drive business confidence and higher capital expenditures, which were supposed to result in higher wages and strong consumption. Would it were so. Business investment in the real economy is weak. While U.S. gross domestic product rose 8.7% from late 2007 through 2014, gross private investment was a mere 4.3% higher. Growth in nonresidential fixed investment remains substantially lower than the last six postrecession expansions. In 2014, S&P 500 companies spent considerably more of their operating cash flow on financially engineered buybacks than real capital expenditures for the first time since 2007. During the precrisis period, by contrast, corporate spending on real assets averaged 10 percentage points higher than on financial assets. Many believe that today’s lack of capital investment stems from a shortfall of global demand. Output gaps can have a dampening effect on investment. But the demand that drives capital investment is future demand. Efforts by the Fed to fill near-term shortfalls in demand through QE and so-called forward guidance have shown limited and diminishing signs of success. And policy makers refuse to tackle structural, supply-side impediments to investment growth, including fundamental tax reform. Second, financial assets are considerably more liquid than real assets. Trade among financial assets like stocks is far easier than buying and selling real assets like capital equipment. The financial crisis taught an important lesson to investors of all sorts: Illiquidity can be fatal. Financial assets have large liquidity benefits over real assets. In other words, it’s far easier to turn stocks into cash than to liquidate a new factory. Third, QE reduces volatility in the financial markets, not the real economy. By purchasing long-term securities, the Fed removes significant market volatility from stocks and bonds. Any resulting reduction in macroeconomic volatility—affecting real asset prices—is far more speculative. In fact, much like 2007, actual macroeconomic risk may be highest when market measures of volatility are lowest. Central banks have been quite successful in stoking risk-taking by investors in financial markets, but have found far less success in encouraging risk-taking in the real economy. Fourth, QE’s efficacy in bolstering asset prices may arise less from the policy’s actual operations than its signaling effect. Mr. Bernanke himself has said that QE “works in practice, just not in theory.” Multiple event studies in the U.S., Europe and Japan show that financial-asset prices move higher when QE programs are announced and implemented, and suffer when QE is thought to be ending. Clearly, market participants believe central bankers use QE, among other reasons, to put a floor under financial asset prices. For real assets, the benefits of QE are far less obvious—and the results far less impressive. 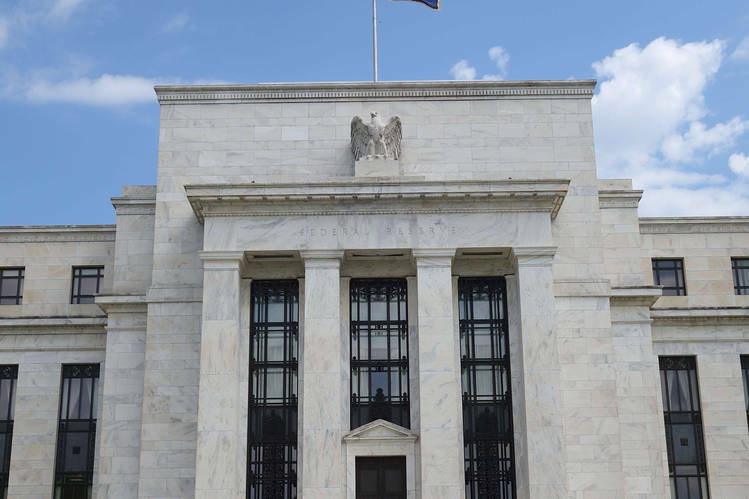 Weak economic data and mixed messages from the Fed in recent months only heighten our concerns about the trajectory of the economy and the sustainability of U.S. financial-asset prices. Inadequate capital investment means that labor is also underutilized. The impact of low capital investment is apparent in the weak productivity statistics. Productivity—key to raising wages and living standards—rose less than half of 1% annually in 2011-14, the weakest four-year run in productivity outside of a recession since World War II. That is an important contributing factor to the meager improvements in median wages during the recovery and the lowest labor-force participation rates since the late 1970s. These trends, if not reversed, threaten to harm the U.S. economy’s growth prospects. We recommend a change in course. Increased investment in real assets is essential to make the economic expansion durable. Mr. Spence, a 2001 Nobel laureate in economics, of New York University, and Mr. Warsh, a former Fed governor, of Stanford, are two of the authors of “Growing Global: Lessons for the New Enterprise” (out next month by the Center for Global Enterprise), from which this op-ed was adapted. Posted on October 28, 2015, in Postings. Bookmark the permalink. 1 Comment. This is absolutely clear and basic…what was the thing that most contributed to the multi-decade funk Japan has been in? Zero interest rated there have stymied that economy…we have a wonderful model with actual data, not modeled data, available to us and we ignore it…..those who ignore history are doomed to repeat it….